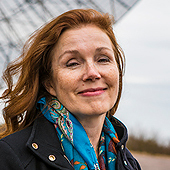 Susanne Aalto is professor of Radio astronomy geodesy and research Head of Divison for the divison Astronomy and Plasma Physics. Susanne's research is focused on the studies of star formation, supermassive black holes and powerful winds and outflows in galaxies near and far. She is using radio and IR instruments to study the cold molecular gas as a tracer of galaxy evolution. A precessing molecular jet signaling an obscured, growing supermassive black hole in NGC 1377? Deep ALMA imaging of the merger NGC 1614. Is CO tracing a massive inflow of non-starforming gas? The NGC 1614 interacting galaxy Molecular gas feeding a "ring of fire"
High-resolution mm and cm study of the obscured LIRG NGC 4418 A compact obscured nucleus fed by in-falling gas? The molecular gas content of the advanced S plus E merger NGC4441 Evidence for an extended decoupled nuclear disc? Molecular gas chemistry in AGN. II. High-resolution imaging of SiO emission in NGC 1068: shocks or XDR? There might be more projects where Susanne Aalto participates, but you have to be logged in as a Chalmers employee to see them.